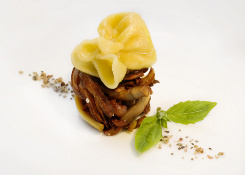 California Gourmet is the restaurant of classical cuisine. California Gourmet signboard is not strident, the interior is subtle, not loaded, the service is perfect, the card of wines is well arranged, and the dishes are prepared by the masters of the highest class only. 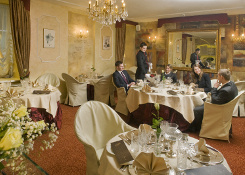 The restaurant values are the good taste, measure, solidness and comfort. California Gourmet is the restaurant with the savor of the American cuisine. For most people the American cuisine is associated with the fast food, however, now we are talking about the bourgeois cuisine that is very different from the popular cuisine. In the American cuisine the culinary heritage of various countries is felt: the American people have learnt constantly from the foreigners, have taken over the ways of cooking, and combined them with their own. Therefore, the American cuisine is the synthesis of various cultures and traditions. Such cuisine prospers from Alaska to Mexico. The restaurant California Gourmet proposes only traditional and healthy food. The freshness and quality is a very important criterion of such level restaurants. We are sure about the recipe of good evening, therefore, the restaurant does not intend to spoil it using unsuitable products or simplified adaptations of food recipes. 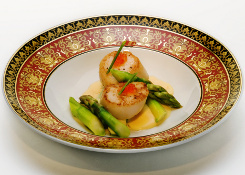 The classics of the French and American cuisine dominate in the menu of California Gourmet. Of course there are lobsters that are delivered right from the depths of the North Atlantic. In the restaurant the legendary foie gras pate, dishes from the duck liver, legendary salad of Caesar and many other well know dishes are served. Only natural sea salt is used for the dishes. The card of restaurant wines is not long, however, well combined. In addition, California Gourmet has the biggest choice of champagne in Lithuania. The interior of California Gourmet is comfortably classical, the restrained tones and temperate luxury are dominant. There are 20 seats in the restaurant, the same number of guests can be seated in the yard of Classicism style under the sun blinds, where the well-groomed decorative plans and flowers catch an eye. Please contact us info@grandbaltics.com to make a table reservation and receive California Gourmet Restaurant A la Carte or group menu.